"Luckily, other people were there who did care and stopped this." A trip to the beach turned into a nightmare for this turtle, who found himself involved with the wrong crowd of people. 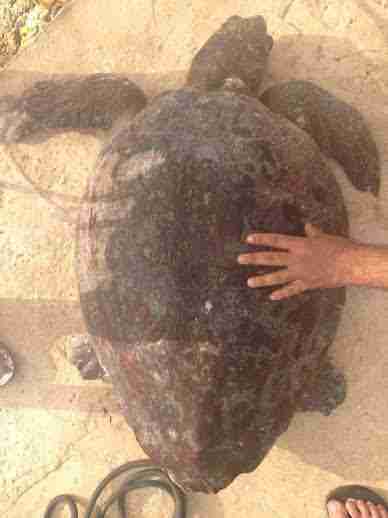 A loggerhead turtle was allegedly pulled out from the ocean at Havana Beach in Beirut, Lebanon. He was not only only used for selfies, but also allegedly attacked. 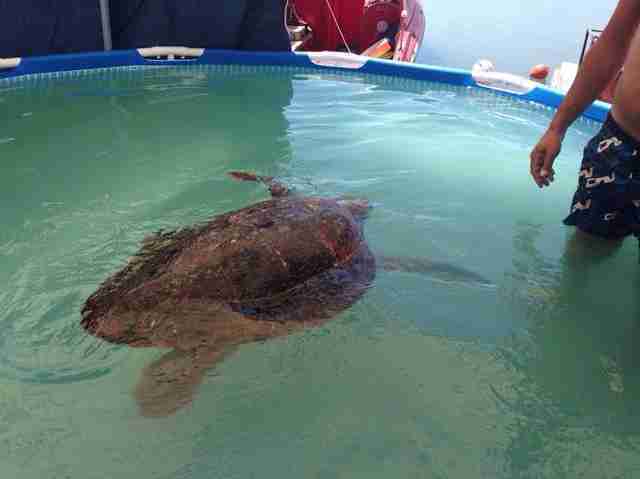 Reportedly, witnesses at the beach saw a beachgoer pull the turtle out from the sea. Then the turtle was thrown onto shore, beaten and stepped on, according to Green Area, which obtained photos of the upsetting scene. 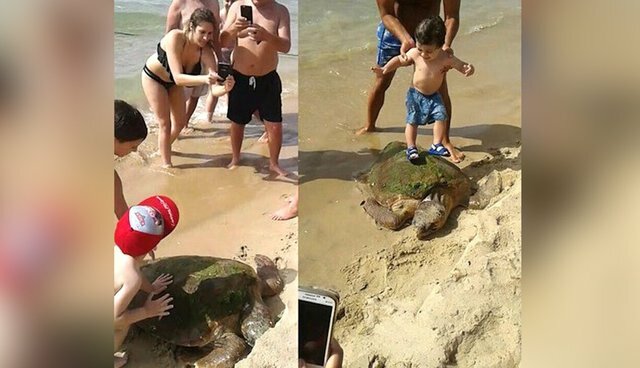 The images show beachgoers posing with the turtle for photos, as well as one beachgoer apparently placing a standing child on top of the turtle. Jason Mier, executive director of Animals Lebanon, told The Dodo that he spoke with a person who claimed to have observed the turtle being hit with a stick on the beach. "We were not present when the turtle came to shore and have to rely on pictures and accounts of people who were present," Mier said. "Luckily, other people were there who did care and stopped this and helped get the turtle to a safe area." Animals Lebanon was one of the handful of organizations contacted to help the injured turtle in the aftermath. The group took on the responsibility of providing the veterinary care the turtle needed to hopefully get him returned to the ocean soon. 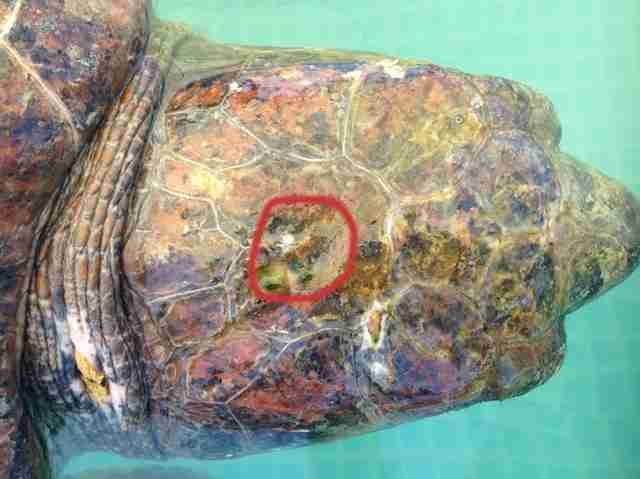 "The turtle has a very evident spot on his skull, the very top of his head, where he has been hit," Mier said. "There is a noticeable depression in the head where the bone has been damaged and sea water is able to enter the bone. A small amount of pressure around this area and the water seeps back out." Mier added that, while there is a possibility that the turtle's head injury may be from a previous experience, he consulted with two veterinarians who both came to the same conclusion - that the turtle's wound came from being struck recently. 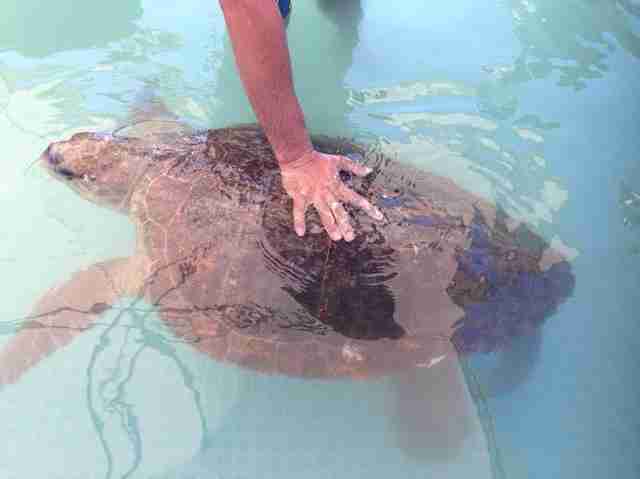 The turtle is currently in a rehabilitation pool set up by Animals Lebanon and is being treated with antibiotics. Mier said at the time of the rescue that the turtle would be reassessed in 15 days to see how far he's progressed. "All that can be done is to give the antibiotics to help fight off any possible infection while it [the wound] is still new and [has] time to heal," he explained. Mier said the concept of "animal welfare" is relatively new to Lebanon, but noted that he's happy to see the country has come far within the past 10 years. While this turtle unfortunately faced a very bad situation, there were still individuals who recognized that he needed help and put his care into the best hands possible.